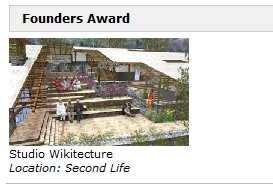 New World Notes: New World Newsfeed: Wikitecture's Collaborative 3D Wiki Technology Claims Open Architecture's "Founders Award"
New World Newsfeed: Wikitecture's Collaborative 3D Wiki Technology Claims Open Architecture's "Founders Award"
There were 566 entries from architects around the world; the Wikitecture submission was a design for a health clinic in Nyany, Nepal. And as Shaw just announced on their blog, they took 3rd place overall and a "Founders Award"-- in recognition, the Challenge announcement reads, "for embracing a truly collaborative way of working using online crowd sourcing and Second Life as a way to create a highly participatory design approach." This is no small nod. Born from the prestigious TED conference, the Open Architecture acknowledgment confers professional status on the highest level. Which is why I think we're seeing the moment when Second Life, and more precisely, Wikitecture, become an industry-standard application for architecture-- AutoCAD for the 21st century. In the award announcement, the top winner's office location is listed as Seattle, Washington. Studio Wikitecture's location simply reads "Second Life". Awww wow....kudos to Keystone and Theory. When I first read about the project I was really excited about the idea but frankly had no idea how brilliantly it would work, and how wonderful the submission would be. 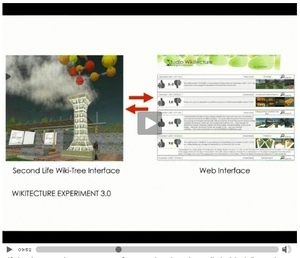 I'm not an expert on architecture, but this is truly a defining moment for Second Life. I expect to see significant pick-up of this story, a renewed interest by the visualization, architecture and design communities, and likely increased positive general business press - who, it seems, have swung around after abandoning the "all brands to SL" storyline - collaboration, training, visualization....those are the storylines of the year, and they're to be followed, I believe, by wider community acceptance and increased users because it will lend increasing legitimacy to the platform. I suspect the next wave of users will be folks who want to take a serious look at the future because they feel that maybe their jobs will depend on it, and who will end up staying and becoming immersed in a community where not only great applications are being developed, but also art, immersion, sociality, and, hey, because it's damn fun.